The secret is plenty of time—it takes about 30 days to make kombucha that tastes like fine champagne. Here’s the method I have developed over the years. I use the 2-gallon kombucha crock from kombuchakamp.com, along with the heating element and the cloth cover (“brewer cap”)—and your SCOBY culture of course. You’ll also need plenty of airtight bottles. I prefer 16.2 fluid-ounce bottles (which I have accumulated by saving bottles of store-bought kombucha) but you can also use bottles with wire-held stoppers, which come in 16 and 32 ounce sizes. If you use the smaller 16-ounce bottles, you will need 3 sets of 16 bottles, 48 in all. If you use quart-size bottles, you will need 3 sets of 8, or 24. Your ingredients are organic cane sugar and organic black tea—I have the found that the best buy is Paul Newman’s organic tea, purchased in boxes of one hundred tea bags each. Place water and sugar in a large pot, bring to a simmer, stir to ensure the sugar is dissolved, and add the 12 tea bags, with the strings wrapped around a wooden spoon (this makes them easier to remove). Turn off heat and allow the liquid to cool; this will take several hours. Pour the liquid into your crock, place the SCOBY on top, cover with the cloth cover, and attach the heating element. Leave for ten days. After ten days, brew a second batch and allow to cool. Now it’s time to transfer your first batch into bottles. I don’t use the tap on the kombucha vessel as the liquid runs out way too slowly. Instead I remove the heating element and the cloth cover from the crock and pour the liquid through a strainer into an 8-cup Pyrex measuring pitcher, set into a sink. If you pour carefully, the SCOBY will remain in the crock, but if it spills out, the strainer will catch it. Now pour the liquid through a funnel into the individual bottles, leaving a little room at the top. Then add ½ teaspoon organic sugar to each 16- or 16.2-ounce bottle—add 1 teaspoon for quart bottles. Put on the wire stoppers or screw the screw tops very tightly. Leave these on the counter for ten days, while the second batch is brewing. Now repeat the process, making a new batch of kombucha and transferring your second batch into more bottles, adding the extra sugar to each bottle. At this point you have one batch of kombucha brewing, and two batches in bottles, sitting on the counter at room temperature. After another ten days, you can transfer your first batch into the fridge—allow to cool and your kombucha is ready. Now make another batch of kombucha; transfer batch number 3 into the third set of bottles and your liquid into the crock. Once you get the process going, you will have at all times, 1 batch brewing in the crock, two batches in bottles brewing on the counter, and one batch that you are working through in the fridge. To serve the kombucha, open the bottles carefully, as they tend to be very fizzy. They will also have developed tendrils of SCOBY, or even little whole SCOBYs in the bottle, so you need to pour through a strainer. Flavored kombucha? This kombucha is so delicious, it really doesn’t need flavoring. However, I do flavor occasionally, using the juice left over from stewed fruit. (My husband is a real stewed fruit lover, which he makes with fruit, a little added organic sugar or honey, a little water and plenty of grated ginger.) Add about 1 tablespoon stewed fruit juice instead of the ½ teaspoon sugar. The result will be some lovely subtle flavors and extra fizziness. UPDATE, October 4, 2016. Recently I made a batch and did not have enough 16-ounce bottles, so put some kombucha in a quart-sized bottle with a wire stopper. It had been on the counter about 15 days when it exploded–leaving glass all over the kitchen. Fortunately this happened at night, when no one was in the kitchen. So I think it best to amend this recipe to stipulate only 16-ounce sized bottles (which I have never had any problem with in over 2 years). If you want to take an added precaution (for example, if your kitchen is very warm), put the bottles in the fridge after 10 days, and let the last 10 days of brewing take place in the fridge. The Weston A. Price Foundation has promoted the consumption of kombucha and other lacto-fermented beverages since its inception. 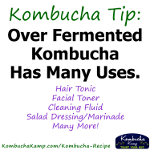 See an early article on kombucha here. Consider becoming a member to support the work we do. Do you not use any starter liquid? Normally when you get your SCOBY, you have some liquid with it, and that goes into your first batch. After that, there is always a little left a the bottom of the vessel. Do you have any suggestions on purchasing good Scoby? Use the Weston A Price Foundation shopping guide! It is updated yearly (WAPF members get a new copy every year). You can also order from westonaprice.org. There are many sources for SCOBYs there. We love kombucha and drink it often. I have recently found out I am allergic to cane sugar. Is there another sweetner I may use or must I give up my favorite fermented drink? I would try beet sugar–hopefully you can find an organic brand. Others make it out of honey, but I think sugar works better. I am a huge fan of your work and a big supporter of the WAPF! I myself make kombucha at home and noticing your recipe that you did not make any mention of when to remove the tea bags from the heated water. Your recipe says to leave it for several hours but I would imagine you only let your tea bag steep for possibly up to 10 minutes? Typically you let the tea steep for whatever the brewing directions are. Just wanted to mention this in case anyone who’s brand new to the process is reading it. I would imagine that they’d want to know that detail because otherwise they leave the tea bags in there for a few hours till it cools and their kombucha may be bitter! Perhaps this was your intention, however so if that was the case I’d like to know that too! Thank you again for all you do. I leave the tea bags in until the water cools–about an hour. How long do you leave the tea bags to steep? I leave them in about an hour, although see the comment above about leaving them in only 10 minutes. So you leave the bottles on the counter for 20 days before going into the fridge? What do you mean a heating element? I brew mine on the counter at room temp for 7-10 days. Can you explain? I have never heard of this. The Kombucha Mamma Essential Heating Strip is wonderful! It allows you to keep the kombucha at just the right temperature without resorting to heating lamps, putting the kombucha vessel in a warm closet, etc. It really ensures that you get a good batch every time. Would the Kombucha Mama heater work for other things like sourdough starters? Yes, it could be used for warming other cultures as well. I made water kefir and on a 2nd ferment if I went over 3 days on the counter they would explode when I opened them. Kombucha does not do this after 20 days in bottles? Kefir cultures are more biologically active than kombucha and will typically be more effervescent more quickly. I have not had a problem with exploding bottles, but I also use plastic caps that will bulge when the pressure gets high – at that point I just “burp” them. Any fermentation is more craft than engineering; there are many variables that affect its progress, so careful observation is key to success. Hi, I apologize that my comment is off topic, but after making curds and whey for more than two years, my last two attempts failed to separate and the milk just soured. I have searched the Internet for clues as to why this is happening, and I have found nothing. Anyone have a clue as to why this is happening? Is there anything I can do to get it to separate now that it is sour? I would really appreciate any help I can get. I hate to think of not being able to ferment my grains anymore. Thank you! I am not sure of the reason, but it would probably help to add a spoonful of yogurt or kefir to the milk when you are starting out. That should help it separate properly. Could I cut the recipe in half? I just read “my new roots” blog….she said to burp the bottles every day on the second ferment. We had explosions at our house on the second ferment, so I may try the burping. Do you wash out your jug before your next batch? I don’t, I just add the new tea directly after bottling. The residual liquid helps culture the new batch. I wash out the fermenting vessel about twice a year. Yes, that’s a pretty warm kitchen, although the 30-day kombucha does get quite sour. You will just have to experiment to see what works. Do you have any data or articles I could pass on to my local Le Leche League regarding breastfeeding and consuming kombucha. So far the leaders are using this article as a source for their answer: Dr. Hale’s medication and mothers milk list from 1995. Next Next post: How Do Animals Feel About Being Killed for Meat?